The Queen of Crime surpasses herself on the sheer ingenuity of the mystery in this book, one which I don’t remember reading before, with a closed house murder set at the dentist’s office. As well as an inspired setting of a dentist practice with only one entrance where everyone is admitted by the slightly goofy doorman with a penchant for American detective stories the author also provides us with a good selection of easily identifiable characters. There are the two dentists, Mr Morely who is shot dead, initially a possible suicide and Mr Reilly who has a drink problem but appears to have an affable nature. With Poirot’s teeth fixed he leaves the house and passes Mrs Sainsbury Seale who loses the buckle of her shoe when exiting the car, she goes into the house. Apart from her there is the mysterious Greek Amberiotis and the brilliant banker Alistair Blunt. One, Two, Buckle My Shoe features the wonderful Inspector Japp who is called in when Mr Morely’s body is found and soon discovers that his secretary Gladys Neville was called away to visit a sick aunt on a false pretext, the telegram she received was a hoax. This is quite a political novel with Alistair Blunt standing for the old order where overspending is frowned upon and his careful management of the country’s money seemingly vital but there are many who want to try a new way, those that believe that the conservative old guard are stopping the country from moving forward, the American Howard Raikes being one of them. Howard Raikes despises Blunt’s policies but he does like his niece Jane Olivera. Another body is found and Poirot is persuaded that Blunt is the target, something backed up when unsuccessful attempts are made on his life. As is often the case in an Agatha Christie novel we are presented with many pieces of the puzzle as the characters and the lives they lead are revealed but it takes a better reader than me to fit them into any semblance of order and find out whodunit. This is another spectacular ending, not quite as ingenious as Murder on the Orient Express, but not far off. 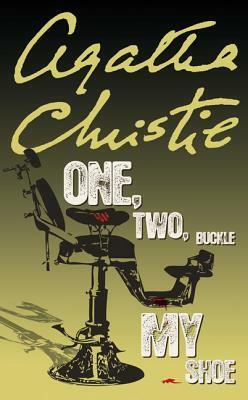 One, Two, Buckle My Shoe was first published in 1940 and is one of my favourite sets of Agatha Christie Novels, those that feature the line of a nursery rhyme. I am sure I must have read this at some point as my sister and I went on an AC binge in our teens ! I really must reread her at some point and this sounds like it would be an excellent choice !! My main problem with Agatha Christie is that I’ve seen all of them on TV. Cleo – There is definitely ingenuity in this novel. The question keeps coming up of why anyone would want to kill an inoffensive dentist. And I like the fact that the novel starts there, because it’s a brilliant way to distract the reader from what’s really going on, if I can put it that way. Absolutely the misdirection that is assumed sends the reader down a different path and even though I knew something was a clue I still didn’t work it out! 😆 I really don’t think I’ve ever read this one before and I rarely guess whodunit! I have to admit I think I’m getting something extra from them reading them as an older, wiser(?) woman than the first time I read them. I usually like the time period but you’d be hard pushed to realise this was written after the start of WWII. Catching up on older posts!! This is one of my favorites as well, because not only is the mystery excellent, but Christie does a fantastic job making her readers face the question of whether or not some lives are more valuable than others. That, in the end, the unrepentant murderer states that he was “just a dentist” and that there are plenty of those – the final scene where Poirot confronts the murderer and they have this conversation about whether or not human life is inherently valuable – it’s truly fantastic writing.